Like many other communities, South Asians have long experienced xenophobic rhetoric, bias, and violence. Many of those who first immigrated to the United States were subjected to anti-immigrant rhetoric and driven out of towns where they settled. After 1965, South Asians often experienced bias in the workplace including the glass ceiling and discrimination against those who had accents. South Asian working class immigrants who moved to urban areas also faced targeting and alienation in the 1980s. For example, during this time, a hate group called the Dotbusters committed numerous acts of hate, such as assault and vandalism, against Indian immigrants in Jersey City, New Jersey. Two of these assaults were so violent that one victim did not survive and another suffered serious brain damage. 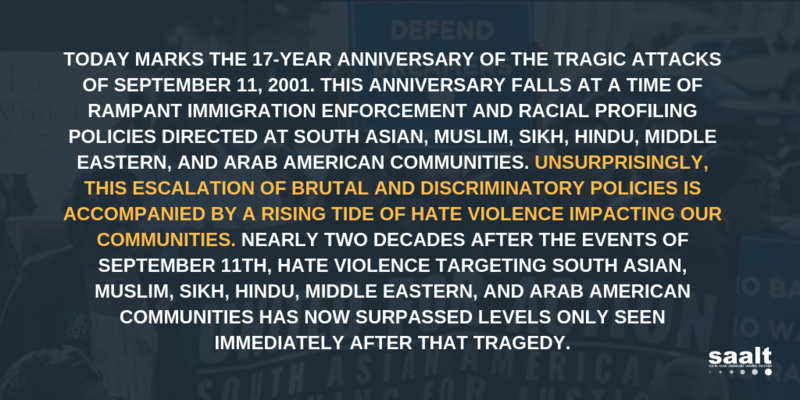 Since September 11th, South Asian, Sikh, Muslim, and Arab Americans have been the targets of numerous hate crimes, as well as employment discrimination, bullying, harassment, and profiling. In addition, places of worship have been vandalized and attacked, including the tragic shooting of the Sikh gurdwara in Oak Creek, Wisconsin and the numerous alleged hate crimes in the Muslim community that followed. SAALT, along with our allies have been tracking hate crimes against South Asian, Sikh, Muslim and Arab communities following the Paris attacks. This is a live document and is updated daily. In addition, around the country, xenophobic and anti-immigrant sentiment has increasingly permeated the media and political sphere. For decades, African Americans and Latinos were subjected to this rhetoric, but more recently, South Asian, Sikh, Muslim, and Arab Americans have increasingly become the targets. These verbal attacks include xenophobic rhetoric aimed at South Asian political candidates as well as a more general portrayal of our community as dangerous through statements by government officials and the media. View this clip from SAALT’s award-winning documentary “Raising Our Voices – South Asian Americans Address Hate.” Contact info@saalt.org to find out how you can host a screening.